Cook sausage in large pot over medium heat until browned. Remove sausage, reserving drippings. Set sausage aside. Cook chicken in drippings until browned, then remove and reserve drippings. Measure drippings, adding enough oil to measure 1/2 cup. Add oil mixture to pot and place over medium heat until hot. Add flour, and cook, stirring constantly, until roux is chocolate colored (about 30 minutes). Then add chopped onion, green pepper, celery and garlic to roux. Cook until vegetables are tender, stirring often. Gradually stir in hot water, and bring to a boil. Add chicken, creole seasoning, and next 4 ingredients. Reduce heat and simmer, uncovered, 1 hour, stirring occasionally. Remove chicken from pot and set aside to cool. Add sausage to pot and cook uncovered, 30 minutes. Stir in green onions, and cook, uncovered an additional 30 minutes. Bone chicken and coarsely shred. 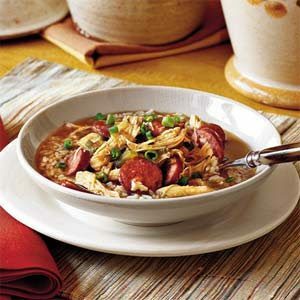 Add chicken to gumbo, and cook until thoroughly heated.